I agree with the other reviews that the generic Frontline smells very bad so beware. The smell only lasts a few days so if you can put up with that it is OK, but it reminds me of a liquid fly trap I once bought - smell was horrible but it sure worked on flies. I am throwing this stuff away and ordering the real Frontline. We are in FL and have always used Frontline+, but we decided to try out the generic version this time. Just put it on our dog today and I don't know how well it is going to work, but buyer beware the product smells like dead fish! When I contacted PetShed they said the smell is normal and that does not mean the product is bad. Just something to keep in mind before you get stuck with a 6-12 month supply. 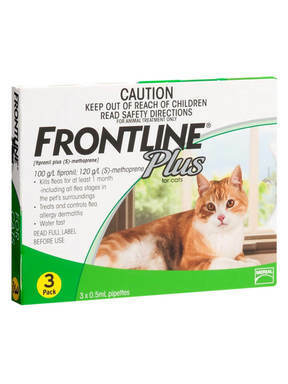 We have been ordering Frontline for our pets for several years and have been consistently pleased. Both our cat and dog have never had fleas or ticks while on the product. For a brief time in the Atlanta winter we went off the product and my dog did get fleas. As soon as we started again the fleas were eradicated - fortunately before becoming an issue in our home. I have priced this product at several websites and my vets. We consistently get the best price thru Pet Shed and it arrives as promised. Due to the distance the medication travel, shipping takes a bit longer but that is know when you purchase it. I have been ordering flea medication for my pets for years from Pet Shed and I am well pleased with their service. I've been using this product for years and never had any problems with it. I would suggest you give this a try. Good product that does what it advertises. Pet shed has the best prices and a speedy process from when the order is placed to when it is delivered.